It’s so easy to get jealous. And it’s also crazy the thing small tiny things we get jealous over. Shawn Lantz, the speaker at the women’s retreat, spent a lot of the first session talking about this. Because as women, we tend to get jealous a lot. And it’s become a stereotype for us. I personally do believe that men get jealous as well, but they are less willing to admit it, at least not publicly. But for women, it’s so present in our lives every day about how we compare ourselves to each other and feel like we can never measure up. It’s a never ending battle we have with each other and with our own selves. To highlight some of the things Shawn talked about, everything she said specifically will be in quotes. God, can I trust you? One of the things Shawn mentioned is how it can be easier to admit you have an anger issue than a jealousy problem. And I think that’s true. We’ve been ingrained throughout our entire lives that jealously is wrong and we shouldn’t be feeling it. But yet it still happens. For example, Facebook is the best way to make yourself feel inadequate. Look at all the things other people are doing! They got engaged! They got married! They bought a house! They are pregnant! They had a boy! They had a girl! They went on vacation! They look perfect! And then we feel like we have to one up them….or just give up and admit defeat that we will never have lives as good as theirs look. I probably should just stop using Facebook for a while but I’m not ready to yet. Maybe there are some people who never have to deal with jealousy. And kudos to them for honestly feeling that way. That’s awesome that you have found a way to never compare yourself to others and want things others have. I’m jealous of you for being that way. HAH. I had a discussion with one of my girlfriends about how jealously in western culture tends to be visually based. We get jealous of material items and body images because that’s what society throws at us. I do believe however that jealously is universal though. In other parts of the world there’s a different type of jealousy. I think humans crave emotional affection and attention so if we don’t get that, there’s always going to be some sort of envy. A personal confession? I get jealous. It can be a struggle right now with all my friends who are in relationships and I’m not after attempts to have relationships keep failing. Every time I receive news that a friend gets engaged, while I’m extremely happy for them, I break down into tears. I’m jealous that they have found someone who chooses to love them. And I want that so badly and it hurts when it won’t happen. I feel like something is wrong with me and wonder what they have that I don’t. But the thing is I also know that even if I get this one thing fulfilled, if not handled correctly and I don’t fix where my heart is, my jealousy won’t stop there. Because people who are dating get jealous of people who get engaged. People who are engaged get jealous of those who are getting married before them. People who are married get jealous of those who are single. People who aren’t pregnant yet get jealous of those who are pregnant. People are pregnant are jealous of those who have easier pregnancies than they do. People who have boys get jealous of those who have girls and vice versa. People who have kids get jealous of those who don’t have kids. People get jealous of those who have bought houses, cars, vacations, etc. There are so many things we get jealous over. And it’s never going to end. I wonder sometimes how could anyone possibly be jealous of me? I don’t have my life together at all. I never have anything interesting happen in my life. I’ve had really bad things happen in my life. What could you possibly think is awesome in my life that is not in yours? Not trying to be cynical here. We want God’s blessings to us to match our desires and/or sense of justice. Since I struggle with this from time to time, I know at least for me I have to just admit I feel this way vs hide it under a rug and ignore it. And when I admit it, then at least I can face the problem and try to fix it. What usually ends up happening is when I feel it’s getting too bad, I pray a lot. God shows me what I can be grateful for, but not in a way that makes me feel guilty. 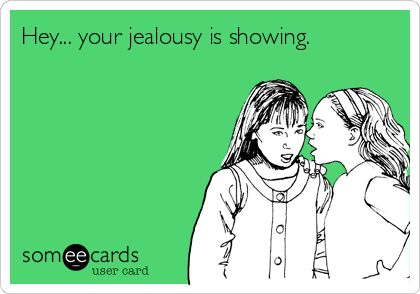 Jealousy is ugly. It’s not becoming and it’s not a quality trait. I’m not going to lie and say that I never have it. I just need to deal with it in a more positive way. Here’s that serious post about the retreat (though I mean bacon can also be serious) I said I was going to write. There were so many topics that were shared that I may write several posts about them over the next couple of weeks. That’s what I love about going to these retreats, all the things I learn. Right now the topic that is sticking to me the most was the session on forgiveness. Because I feel that is what God has been hitting at me the hardest. The speaker gave us this definition of forgiveness: “The relinquishment of my right for revenge against someone who has wronged me.” She spoke about how there are times when the person who has wronged us has no idea that we are struggling with forgiving them. That we will spend hours imagining scenarios where we confront them or have them come begging us to forgive them and we turn them away. And I realize that is something I am really struggling with right now. And I have been for a while. And therefore this is what I felt compelled to do after a lot of prayer over the past few days. You may or may not ever read this. You also may or may not realize that I’m talking about you. There is also an even bigger chance that you may not realize that you hurt me (or maybe you do, and you just don’t care). But that’s ok. It actually doesn’t really matter if you do or not any of these things. Because when it all comes down to it, it’s between me and God and not really between me and you. I don’t really need to tell you to your face that you hurt me or that I even want to forgive you. I just need to actually do it. A lot of things have been holding me back from doing it. Pride is probably the biggest one. I’ve been feeling that if I forgive you and let it go, it means that you “won”, that you got a free pass, and it won’t ever bother you. Meanwhile it left me hurting even when I tried not to let it. And I was afraid that I needed to be free from the hurt before I could forgive you and the hurt wasn’t going away to allow me to get to that point. To some people what you did probably wouldn’t be a big deal to them and they would just wave it off and move on. But for me, it reopened up wounds that weren’t completely healed yet and it exposed my vulnerability which left me raw and weak and angry. And even though I hid it all on the outside so no one could tell, on the inside there was a lot of emotional turmoil that left me feeling bitter and resentful towards you. But I don’t want to hold on to that bitterness anymore. I don’t want it to keep building to where it eventually takes over and I forget about why I was even angry/hurt to begin with. It may not ever be in God’s plan for me to ever discuss this particular situation with you or even talk to you again. But I have to let this go. It may not be doing any harm other than to me right now, but if I continue to leave it as an untreated wound, it will grow and fester and becoming poisonous. I’d like to say that immediately everything was all better and I’ll be perfectly fine from now on whenever I see you or if you ever cross into my mind. But that’s probably not true and I’ll be lying. But I can say that, I do feel a lot better now. And with God’s help, I’ll let go and one day I’ll look back and even though I may never know why all this happened, I’ll understand that it was all part of his plan. And I’ll learn from it. And I’ll be ok. I don’t need to justify why I did this. And for the record it’s not to just make myself feel better or to shame you or anything. You don’t even need to apologize for anything. I’m doing it because I know I need to forgive, as Jesus has done for me. So, person I need to forgive, I’ve forgiven you. Women’s Retreat: Bacon, Diet Coke, Chocolate. And more bacon. Ah, the perks of a women’s retreat. This past weekend I went to one hosted by my church. I’ll talk more seriously about it on another date. Today is just my decompressing of obviously the most important highlights. This is the second year that I’ve attended the retreat. In the past, I thought about going but then I (and probably like most 20somethings) thought “It’s mostly for moms and older women. They aren’t going to talk about anything I will relate to. They don’t know what it’s like to be in my stage of life.” Famous last words. The retreat was a hotel nearby so I didn’t feel the need to pay the extra $$ to get a room because as I’m not a mom I don’t feel the need to get away. I just commuted which sometimes felt awful (thank you time change). Finding a table to sit at is like entering a high school cafeteria for the first time. Everyone seems to know each other and you’re the new kid. Should you join a table where people are already talking or should you start up a new table and see if anyone will join YOU? I ended up doing the latter. I was worried because it took about 10 minutes before anyone else joined me (oh gosh what if NO ONE does??) but finally the table filled up. We got split up into small groups and I’m like…oh noes! I don’t know anyone in my group! It’s because of how I filled out my demographics! Wahhh! “Psh,” said God. “Trust me.” He was right. It was much good times. Food at retreats is always so good and we’re always eating it seems. I mean, not having to cook the food yourselves is a bonus. And then having delish food on top of that? Win for everyone. And there was bacon on both of the breakfast buffets. BACON. BUFFET. Yep. I was happy. BACON. It’s also nice having a beverage bar of soda, tea, coffee WHENEVER YOUR WANTED. One could get spoiled. I may or may not have had more Diet Cokes this weekend than I normally drink. This would explain the not being able to go to sleep. All in all it was a great weekend. The speaker was fabulous and there was lots of time to catch up with old friends and make new ones. Learned a bunch of new things (including if you cram too many women into an elevator, it will not move up) and was able to share my own experiences as well. Like I said, I’ll share some of the more serious things I learned on a later date. Right now I’m just missing all the bacon. And the fact that there is not a lunch buffet waiting for me. I do have Diet Coke though…..